The Brockton 21st Century Corporation, a public-private partnership that serves as the economic development arm of city government, hired The Keefe Company, working with Frederic R. Harris, Inc., to develop an action plan to revitalize the city. The eight-point action plan, released in early 2001, called for improvements in housing, transportation, parks, and educational facilities, and the construction of a minor league baseball stadium. 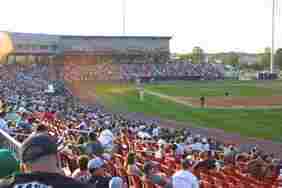 The new Campanelli Stadium, home of the Brockton Rox of the independent Northern League, opened in May 2002. Efforts are underway to carry out other elements of the eight-point plan. The Keefe Company also produced a redevelopment plan and implementation strategy to transform the former King Size factory site into the downtown Montello Industrial Park.